The luxurious ruddy hues in the BRISTOL CHERRY Vanity provide a traditional rich and elegant appearance that works with just about any design. The Bristol collection from the JSI craftsman bathroom collection is a very popular design and comes in three different colors. The top quality bathroom cabinets feature full overlay and recessed square panel doors for high quality and long lasting durability. These bathroom vanities and accessories add value to your home and offer rich details, attractive finishes and a variety of sizes and extra options that can be used to create custom results. 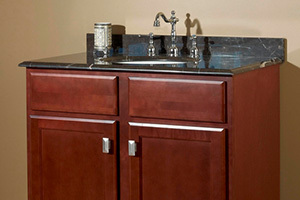 The BRISTOL CHERRY Vanity collection is also very functional and provides many benefits to the homeowner. Concealed six-way European style hinges and optional soft close hing upgrades, as well as side mount, epoxy coated 3/4 extension drawer glides, help to make these units a pleasure to use. These top quality bathroom cabinets from the JSI craftsman bathroom collection are available at Cabinet Factory Outlet, helping homeowners to stay on budget with remodeling projects and upgrades. A remodeling project that includes these bathroom vanities and accessories will provide many years of style and function.